Ideally, when you’re rewarding your pup for good behavior, you’ll want to grab a small treat that is healthy and drool-inspiring. But, sometimes that’s not so easy! 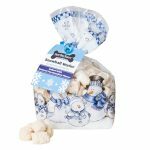 Here are some seasonal treats that are the perfect size for rewarding. They’re also wonderful for use in food-stuffed toys. Fill your pup’s tummy with something special. 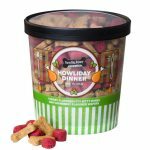 Our Howliday Dinner treats have all the season’s favorite flavors. It contains Itty Bitty Bones with Turkey, Sweet Potato, and Sage paired with tiny Cranberry wafers. It’s round. It’s all-natural. It’s oven baked. 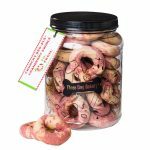 It comes in a reusable Three Dog Bakery jar! It’s our Cranberry Swirl Beg-al®! What’s not to love? 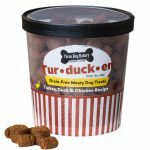 These hard baked treats are great for larger dogs. This customer favorite is inspired by the show-stopping holiday roast; turducken, a chicken stuffed into a duck stuffed into a turkey. Our version combines all of these savory holiday flavors into one delicious grain-free, soft and chewy wafer. Our take on a popular seasonal coffee shop offering! The Beg Nog Latte features cinnamon miniature wafers topped with tiny vanilla wafers. Double the flavors. Double the tail wags. Walking in a Winter Wonderland. These tiny vanilla wafers are a customer favorite and they’re back again as a perfect wintertime treat. Cinnamon spice and everything nice! 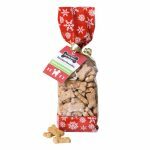 Pups are sure to enjoy our twist on a Holiday favorite! 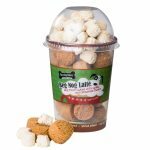 Snickerdoodle Itty Bitty Bones are a cinnamon and molasses biscuit perfect for dogs large and small.